Special 3-3 is the third level of Special 3 in Super Mario 3D Land. It is based off World 7-3. The player starts out on a tree stump before moving forwards onto a Tightrope that contains a + Clock on it. The player will then need to jump onto some more Tightropes that lead up a massive tree, while avoiding the Fuzzies. The player will then come across a Warp Box that they must enter to proceed to the next area. 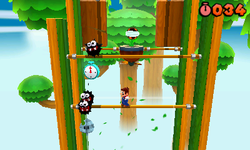 In the next area, the player will need to jump over three Tightropes and a single Fuzzy before landing on a large wooden platform that contains the Warp Box to the next area. Then, the player will have to jump up several Tightropes, while avoiding several Fuzzies, in order to reach another Tightrope-filled area where there are some Para-Biddybuds flying around. Soon after, the player will find the Warp Box to the final area, which contains a + Clock and two Tightropes that the player must use to get to the top of the Goal Pole. Star Medal 1: Floating above the first Fire Piranha Plant. Star Medal 2: Located to the right of the second Warp Box. Star Medal 3: Using the diagonal tightrope the player can jump off it to collect the third Star Medal.